In the longer term, auroral displays are correlated with an 11-year cycle in sunspot activity; the more restless the sun, the more aurorae. The most recent maximum in solar activity was likely during 2013, with frequent Northern Lights displays continuing for another two or three years after that. Ken Scott, a Northwest Michigan photographer, offers the following tips to help you capture the best images of the Northern Lights. I'm not a scientist nor a techie, but I do love to watch the night sky and especially the Northern Lights. I post images/videos (timelapsed) when I have something to share and usually get asked a few questions over and over again, so I will try to answer them best I can and offer some links to monitoring sites that you can check out for your own forecasting...feel free to send me info to post. The number one most asked question is "When is the best time to view the Northern Lights?" The simple answer: on a dark, clear night when the Northern Lights are active in your region. The not so simple answer is: it depends upon how strong the display is. I remember the display in November, 1991 and the news stories that followed, my favorite being that the 911 system in Chicago was trashed from folks thinking the city was on fire! My point being that if the display is strong enough, you don't need as dark a sky and if it's a really strong display you don't need to be as far north as you might think ...that same storm in '91 was seen as far south as Arizona! So, find as dark a sky as you are able and give your eyes time to adjust to the dark ... your pupils need to dilate to be able to see more light and any light you look at (such as a cell phone) hinders that process. "What time of the year offers the best viewing of Northern Lights?" Anytime they are active! We seem to see them more in this 45th parallel region as opposed to further south due to the longer nights and earlier darkness. Summertime dark hours last from around midnight-4am, winter darkness is usually about 6pm-8am. The displays depend on the sun's solar flares and the direction of solar wind from the storm. If the earth is in the path of the wind, there is a chance of aurora displays. "Why should a person stay awake to capture images of the Northern Lights?" Because they are mysterious and gorgeous! "What is one of the best ways to see a Northern Lights display, especially if the lights are barely visable?" Use a sensitive digital camera and crank up the ISO as high as it will go, open your f/stop as wide as it will go, put your camera on a stable base or a tripod, and make a long exposure to see if any lights are being captured. Try from 10-30 seconds and turn off the noise reduction so you don't have to wait too long to see if it's happening. Also, be sure to use a cable release or your camera's self timer so you don't add button pushing shake. Cameras are much more sensitive to the light than our eyes are and can pick up faint auroras before our eyes can see them. If they are happening, stick around, they may get better. In the mean time, fine tune your exposure to reduce the noise. "Are Northern Lights only viewed to the north?" No, they are most often seen to the north because that is where they originate from. But the display can be global, it just depends on the strength of the solar wind. "Are there peak hours they appear in the sky?" Not that I am aware of...I've seen them in the twilight and at dawn! 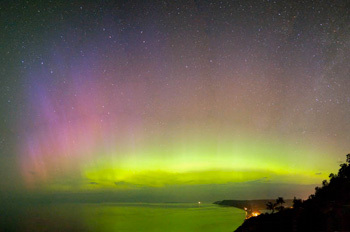 "Where are the best locations in Leelanau County and the Grand Traverse region to view the Northern Lights?" The best viewing is usually along the shorelines and hills, away from lights. Scope out your favorite spots before the display is happening so you will know where to go when they appear. 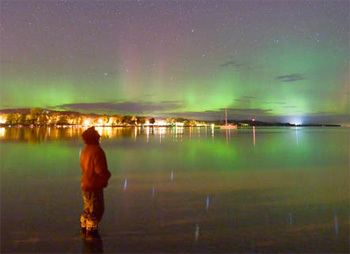 See Ken Scott's Northern Lights photos available for purchase. Here are some suggested links for forecasts and more information about the Northern Lights. Would you like a call when solar flares are underway? X-flare alerts are available from spaceweathertext.com (text) and spaceweatherphone.com (voice).